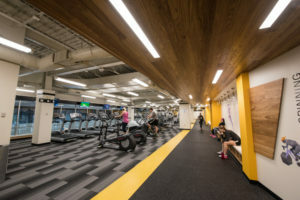 The Mezz Fitness Center, located on the top floor of the student union, opened to students last week as the most recent in a series of campus developments this semester. The fitness center was developed to give students an alternative workout space to the Capital Center, which many find athlete-specific. Students, faculty and staff with a valid Capital ID can access the facility from 7 a.m. to 11 p.m. seven days a week, via the student union’s northeast stair. The fitness center houses a wide variety of cardio machines, weight machines, a free weight room, a spin room, and a s ynergy multifunction machine. The facility also includes televisions, restrooms and an area for visitors to store their belongings while they exercise. Over winter break, the Capital Center also received updates, including renovations of the lobby, a fresh coat of paint, and new flooring. The building opened in 2001 as a complex for both athletic programs and student fitness, and it caters to an average of 850 people per day. Although the building is mostly seen as a space for athletics, it also houses classrooms and office areas for the health and sports sciences department, as well as offices for the athletic department. The building contains a field house that can be split and used for a variety of events, as well as a weight room and fitness area complete with treadmills, StairMasters and a universal exercise unit. The regular hours of operation are Monday through Thursday 6 a.m. to 10 p.m., Friday 9 a.m. to 9 p.m., Saturday 9 a.m. to 8 p.m. and Sunday 11 a.m. to 8 p.m. The new semester has also brought new parking options for students with O-lot permits. The two new lots, O1 and O2, are located just north of Capital Commons and just north of the Trinity Apartments on Main Street, respectively. The new lots are within walking distance of campus and are not gated, offering open access. The original, gated O-lot will remain open to O-lot permit holders throughout the semester, with the shuttle service running Monday through Friday 7 a.m. to 9 p.m. and Sunday 2 p.m. to 9 p.m.
Due to a limited number of spaces between the new lots, approximately 100, some students will still need to park in the original lot. This semester also marks the first time classes have been held in the Convergence Media Center (CMC) since construction concluded in the fall. The building was designed around the contemporary architectural emphases on open collaboration and reduction in closed spaces. The new building offers various workspaces for students, faculty offices, and classrooms for majors such as professional writing, journalism, music technology, marketing, and electronic media and film, to name a few. The CMC also houses CapTV, WXCU and the Chimes, as well as a recording studio and digital art and recording studios. Students can access the building from 7 a.m. to 10 p.m. Monday through Friday.